Well, I am now officially a DC United Player. I spent the weekend with the team and I am very excited about the upcoming opportunity. I will miss Columbus, the fans, and so many friends. I love you all. I know I am going to love being in DC now also. This past weekend we felt Filleo needed to move in a different direction concerning our Columbus Project:Avondale and have decided not to do the project. We had many things ready for a fun-filled time with kids. We had two volunteer caricature artists, a fire engine (for exploration and hopefully shooting water from the hoses! ), soccer clinic, tons of pizza, dental kits, first aid kits, sports equipment, and school supplies all ready for the event. We had volunteers and things were shaping up for the event to take place. So far, into our second year we have raised over $4000. We are so happy that money will go to support children in need. However, I was convicted that this Filleo project and the idea of a big event was selfish. I do not want to put on an event for cool pictures and videos. Especially when my mind could not get off of those families that were not able to make it to the event. The logistics of getting kids out to the event are tricky, especially when most of them live in single parent homes. There are so many non profits already doing great things in our community, so we want to come alongside them and assist with what they are already doing. Helping kids in need is not about advertising for Filleo. We want to be a small part of a bigger movement here in our city, and our world, that is reaching out to children. We want to build a community of unity. We want to support those already on the streets helping those in need. So, we have cancelled this project and have decided to go in another direction. -Going house to house and delivering school supplies to families in a low income neighborhood. We have found that the average family, no matter their income, has to spend up to $600/year per child for school supplies, books, and clothes for school. -Volunteer at a local church (Vineyard Columbus) that has a HUGE single parents fair. We will be bringing school supplies, first aid kits, dental kits and sports equipment for those families. -Either go to a local YMCA or boys and girls club and bring supplies to those children also. We are so excited about what we are able to do. We want to do it one house at a time and spread that Filleo (phileo) love to each and every one of those kids. We hope to do these grassroot projects a lot through the year so I will keep you posted. Thank you so much for your support through everything. We have had some amazing people come alongside us to help children in need. I tell you what, the two coolest things about doing what I am doing is not only helping children in need, but meeting some of the most compassionate and gracious people a guy could ever meet. Just as we say here in our community, our goal is to "Live beyond ourselves, give beyond ourselves, and love beyond ourselves." One Cause. One Love. One Community that is Unified. What up ya'll? I hope all is well. There are some big things happening with Filleo in the next month and I am updating everyone. We are doing a Car Wash Fundraiser to raise funds for children in Ohio, New Orleans and In Monterrey, Mexico. If you do not know already New Orleans is being ravaged economically by this oil leak and we really want to help those children out down there in some way. Also, in Monterrey they have had one of the largest rainfalls ever to have happened in their city, due to Hurricane Alex. They had 39" in 8 hours and counting. Most people live in homes that are not built for such stress and there have been hundreds of deaths. We are headed down to Monterrey in January for some relief efforts. I am emailing everyone with a hope that you all will spread the word about our car wash and where it is. Below is a sweet flyer that you want to print off just shoot us an email. But, most importantly we would love to have you come out and volunteer. It is going to be so much fun. If you want to volunteer just reply back to this at jedi@filleo.com. We will reply back with more details. 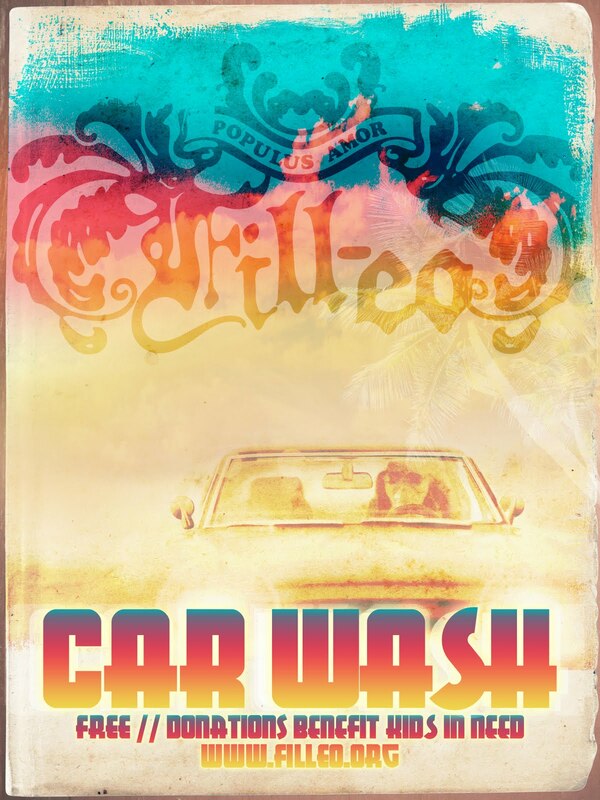 This car wash is free, but we greatly accept donations towards the children we have a desire to help. All donations are tax deductible. Also, there will be COLUMBUS CREW soccer player's at our events, come on out and have fun with some pro's. Lastly, we are having our first annual Columbus Project August 11th. It is our biggest of the year and definitely the most fun. It will be from 4-7pm at Avondale Elementary. Again we would love to have you volunteer. We are giving away school supplies, sports equipment, clothes, food, caricatures, putting on a soccer clinic, and many other fun things. We would love for you all to join our cause in the front lines against poverty, injustice, and fighting for education in children's lives.